Parents quickly learn that a baby’s favourite place is in the arms of their parents, being rocked or swayed. But why is that? Babies spent 9 months moving around, everywhere mummy went, they went too! So when they’re born, they like to be jigged, rocked and bounced, to remind them of the safety and comfort of the womb. The problem with this is that parents are already very busy looking after a new baby, and sometimes older siblings too, and they often need time to get things done, to wash bottles, take a shower, make dinner, have a few minutes doing something for themselves for once! As a parent, you can’t be in two places at once, so while you do other tasks, you need a parent-substitute to soothe your baby in the form of a bouncer, rocker or swing, preferably something lightweight to take room to room in order for you to keep an eye on your baby while you complete your to-do list. The problem is that there are so many things in which baby can play and rest, so how do you decide which one you actually want or need? What are bouncers, rockers and swings? Bouncers tend to be the smallest, and often cheapest option. The bouncing motion is caused by the baby’s own movements, or with the helping hand of a parent. If you physically rock your baby to sleep in a bouncer, there is a risk that baby will wake up when the movement stops. The base of a bouncer is stable and only the seat moves, which brings us to rockers…. There are 2 different variations of rockers. The simple rockers have a rounded base, like a traditional adult-size rocking chair, which rocks back and forth with the baby’s movement, and they often have a lying down and a more upright position which means you can use the rocker for a young baby and throughout their toddler years in the more upright seat position. the other kind of rocker is a little more advanced: the bassinet rocker. Bassinet rockers are sometimes called sleepers or soothers, but they all mean the same thing- a mechanically powered reclined bassinet, which is often safe for baby to sleep in too. Finally, we have baby swings. swings are more technologically complexe, they are mechanically powered and have various options of movement, sounds, vibrations and other kinds of stimuli. Baby swigs take up a lot more space than bouncers and rockers because the seat is higher off the ground therefore they require a wide base for stability. The movement keeps going so you don’t have to physically rock it, but they are more expensive than bouncers and rockers. The qualities to look for when buying one of these products, depends on your own personal needs. If you have a tight budget, you should consider something with several purposes, like a rocker/swing combination, or something that grows with your child so that you can use it for a long time and get your money’s worth. If you have a larger budget, parent’s often buy a couple of products, for example a swing for the living room or nursery, where it will stay, and a smaller, more portable and lightweight bouncer or rocker than you can move from room to room when you are busy doing other things. If you’re buying a product before the bay is born, beware, they may be small and sweet but babies are extremely opinionated, so you will know if they don’t like the item and you may need to change it, so be prepared to swap or sell your item. Again, multi-function swings and rockers or bouncers are great to avoid this problem, and sometimes there is one setting that the baby doesn’t like, so try trying off certain sounds or vibrations to find somhin that your baby likes, and don’t be put off it he/she cries at first, they will take time to adapt to their new bouncer/rocker/swing just like any of us in a new environment. Size matters! Swings can take up a huge amount of space, while most bouncers are really small, so this depends where you want to use it and if you wan tto move it around. When it comes to size, weight is important too because it decides whethe ror not it is portable. If you need to transport your swing, bouncer or rocker, not just carry it around the house, but to leave the house either visiting family or going on holiday, yo need something that folds nice and compact and is again, lightweight. Also, it needs to fold if you plan on storing it when you’re not using it, or when your baby outgrows it, so that you can save it for future children. Babies are not the cleanest of beings, its a fact of life! As new parents you will quickly get used to being covered in the bodily fluids of your mini-me, and your swing or bouncer will be no alien to the odd nappy didisaster. This means you absolutely need a wipeable surface or machine washable fabric that is easily removed (you don’t want to get mess everywhere while removing the seat cover!) Preferably you’ll find something that is tumble-dryer safe as well, because this will save a lot of time and effort. Music, mature sounds, vibrations, there are many different options, especially with swings, which have the most the choose from. This is a matter of personal choice, if you need the music or vibrations if if simplicity is best. Note that bouncers often have the least additional features while swings have the most. For some parents, this doesn’t matter, and for others, it’s make or break. If you’ve spent a long time designing and decorating your house or apartment, it might be hard for you to buy baby things that don’t match, or completely ruin your colour scheme. There are many modern, stylish options if you don’t want the typical, colourful or themed products, so know that you can find something to suit your taste while being totally safe and fun for baby. Below are some of the best baby bouncers and baby rockers, to see reviews of the best baby swings, click here. The Fisher-Price Comfy Time baby bouncer is a simple bouncer with an ergonomically cradled seat to increase baby’s comfort. The gentle bouncing will soothe them, as well as the calming vibrations which can be turned on and off. They can play with the toys on the activity bar when they are in a playful mood, to improve their physical strength and their motor skills, and there is a removable teether included. The seat is machine washable and dryer safe for speed and practicality for parents, and the non-slip feet and 3-point harness add extra security for your tot. 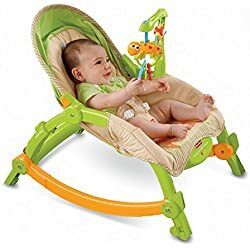 This Fisher-Price bouncer is simple yet sturdy, safe and, like most Fisher-Price toys and products (in my experience), long-lasting. The Bouncer Balance Soft by Babybjorn is an ergonomic bouncer made with soft fabric and a snug design, suitable from birth. It softly bounces naturally with no batteries ad when your child outgrows it, they can use it as a chair up to 2 years old. You can rock the bouncer while your baby is very small, and then they will learn to rock it by themselves which will help them develop their motor skills and balance. The baby’s weight is evenly distributed throughout the bouncer with the fabric molding to their body shape and their head and neck are fully supported by the ergonomic design. You can recline this bouncer to three positions, making it suitable for both rest and play, and it also folds completely flat for transportation and storage. The materials of the Bouncer Balance Soft are harmless for baby’s skin and are also safe to chew on. The seat is also removable ad machine washable. This bouncer was created with the help and expertise of many medical and baby professionals in order to make a safe and comfortable baby bouncer than can be used from birth. Finally we have a mid-range price bouncer from Ingenuity, which is the SmartBounce Automatic Bouncer. This bouncer is intended to mimic the soothing movements of a parent, and has 2 bouncing speeds, which continue automatically for 30 minutes before shutting off by itself to avoid using too much battery. The HybriDrive swinging technology uses less battery so t hat batteries last up to 3 times longer. Being battery powered, you can take it practically anywhere with you. There are 8 melodies and 3 soothing nature sounds to lull your baby. The control panel is at the top of the bouncer as opposed to the typical bottom side position, which gives parents easy access without disturbing baby. There is a toy bar with 2 plush toys to further entertain your little one, and the toy bar can be moved out of the way for parents to more easily access baby. 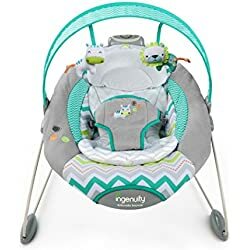 The non-slip feet and 3-point safety harness will reassure yo of your little one’s safety in this bouncer, and for comfort there is an infant insert and head support, which are machine washable. Parents criticized the toy bar on the Ingenuity Bouncer which comes off slightly too easily when moving the bouncer around or touching it, however they said that this is one of the best baby bouncers if you want something hands-free because it bounces by itself, but if you wish, you can give it a bounce manually when it is turned off. This automatic bouncer comes in 3 colours, click on the pictures to see more. This Fisher-Price rocker is an amazing, low cost baby rocker, available in 2 colours. The infant-to-toddler rocker can be used from birth up to 40lbs. The rocker has a kick out stand which prevents it form rocking, for feeding and other moment that you require a stationary place for baby to sit. Without the stand, the baby’s movements cause a gentle rocking motion to soothe and clam him/her. There is a toy bar and music to stimulate the baby’s senses an d help them learn, and the toy bar can be removed for nap time, and gentle vibrations can be turned on. The seat pad is machine washable and dryer safe. These rainforest themed rockers are available in pink or green. The deep cradle seat is great for newborns and can be used as a seat or mini rocking chair by toddlers. Parents say that the vibrating can be loud, and it doesn’t fold which is a disadvantage, but most love the fact that it’s lightweight and low cost and can be used anywhere around the house, and for a long period of time. The batteries need changing every few months if you use it constantly, but for the extremely low price, it tends to be worth it. The TinyLove 3-in-1 Rocker Napper is a 3-position baby rocker which converts easily with one hand into a lie-down napper, with the sides raised for baby’s nap time. Not only does this Tiny Love rocker move back and forth in a rocking motion, it also has vibrations to soothe and calm your baby. There are also a variety of fun and relaxing tunes to entertain or calm your little one and baby-activated lights, as well as a mobile with toys to engage and stimulate your baby, which can be moved out of the way for easy access for mum and dad. 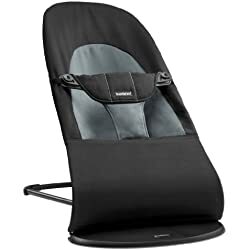 The sleeping pad and the bassinet are machine washable for your convenience, and both the rocker and lie-down sleeper can be set to rocking or stable position, and the non-slip feet keep it in place on slippery floors. It’s really practical to have a rocker that doubles as a daytime cot for naps for your newborn, and the rocker can later be used as a seat as your babies grow up to 40lbs. This rocker and mini-bed comes in 3 different colours.